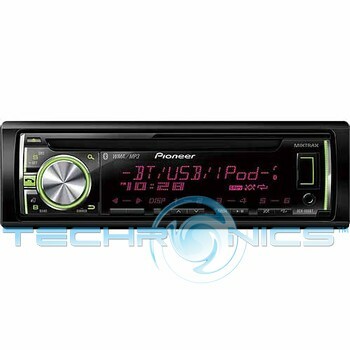 This Pioneer DEH-X66BT Single In-Dash CD Receiver by MIXTRAX plays CDs, MP3 and WMA files. Conveniently, you can also control your Apple iPod from this device. This Bluetooth CD receiver with Apple iPod Control, Android control is Pandora-ready, comes with USB and aux inputs and features a multi-line LCD display. Bluetooth technology allows you to stream music wirelessly. This CD receiver for your car holds one disk a time. This is a versatile and handy item for people who like to listen to Pandora or talk on the phone using Bluetooth in the car. Dimensions: 2" x 7" x 6-5/8"